The Executive Chairman, Federal Inland Revenue Service, Tunde Fowler, has stated that Value Added Tax is primarily designed to support poor Nigerians and not to create hardship for them, as it is charged on consumption and capacity to consume. The FIRS boss made the clarification in Lagos at the weekend at the maiden edition of the Nigeria Tax Outlook Stakeholders Roundtable Series, organised by the Nigeria Taxpayer Hub. Fowler noted that the revenue generated from VAT is channeled towards assisting the poor by providing basic amenities. He explained: “When you don’t consume certain categories of goods and services, you are not liable to pay VAT charges on those items. “VAT is not charged on all medical and pharmaceutical products. “It is not charged on basic food items. “It is not charged on books and educational materials. “It is not charged on baby products, fertilizers, locally produced agricultural and veterinary medicine. Fowler equally explained that VAT is not charged on all exports, plant machinery and goods imported for use in Export Processing Zones and free trade zones, provided that 100 per cent production of such company is for export. 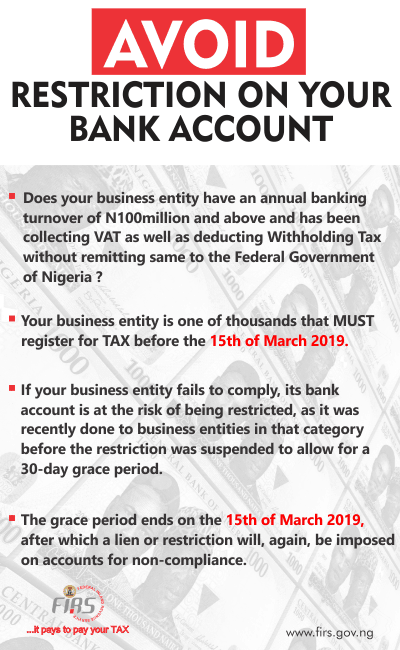 According to the FIRS boss, other services exempted from VAT are medical services, services rendered by community banks, mortgage Institutions, plays and performances conducted by educational institutions as part of learning and all exported services. Fowler also clarified what he told the Senate Committee on Finance last week, saying what he called for was an increase in the number of Nigerians and companies paying VAT and not a 50 per cent increase in VAT rate. He also called for a reduction in Companies Income Tax rate for small businesses so as to improve compliance. He stated: “Some people got it a bit wrong. “Let me clarify some things. “I understand that some people misunderstand what the VAT is. “VAT is a consumption tax. “If you don’t have money to purchase certain categories of goods and services and you don’t consume them, then VAT is not your problem. “VAT is used to assist the needy. “VAT provides support for the needy, not a hardship on them. Fowler added that if countries like United Arab Emirates and Saudi Arabia, which are rich in oil resources, would be laying emphasis on taxation, Nigeria should also emulate them. At the event, experts in tax practice, administration and tax consultants from KPMG, Pedabo, Deloitte, Ascension, PWC, Anderson Tax, Lagos State Internal Revenue Service, Drudge among others pointed ways forward for tax practice in Nigeria.